I’m actually on a train today—yes, a train in California—and so I can’t watch either the intelligence committee hearings or the Gorsuch nomination hearings. But I see that Paul is on the case, so we’ve got it covered. I can’t think the left and the media (but I repeat. . .) are happy to have both of these hearings going on simultaneously, because they commit fratricide against their outrage efforts. In any case, the internet on my train is surprisingly good, so I can, alas, still read the fake news. 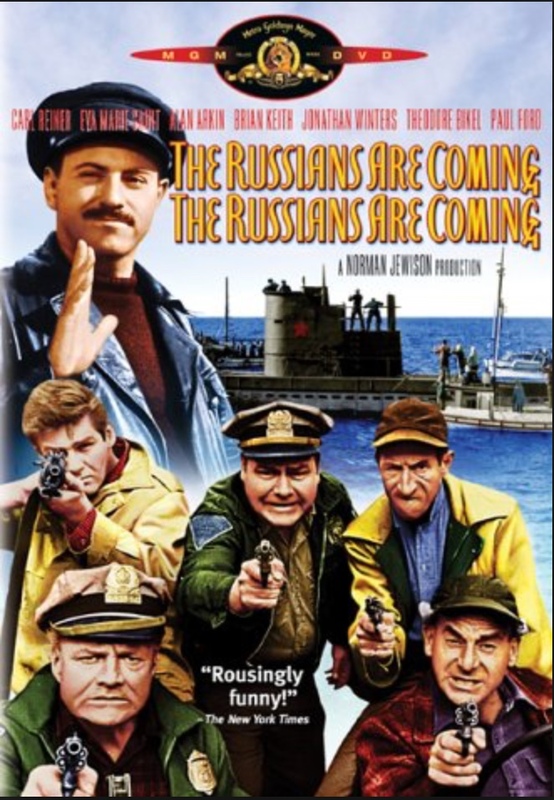 So desperate are the media and the left to undermine President Trump that they’re even willing to attempt a reverse-remake of the 1966 classic The Russians Are Coming! The Russians Are Coming! That was one of the first films, along with Dr. Strangelove, that attempted to portray the Cold War as some kind of grand misunderstanding or comic misadventure. At the end of that movie, you may recall, the local townsfolk help the loveable, cuddly, and unthreatening Russians get away in their submarine by providing a protective flotilla against an attack from our terrible, horrible, no good military industrial complex. It helped that the Russians of The Russians Are Coming were seen as bumblers, and not the evil power seekers we know them to have been in the Soviet era. The reverse remake currently underway as a sort-of reality TV series has the evil Russians 10 feet tall again, and the Democratic Party as the bumblers who couldn’t make anything out of this during the fall campaign. So now the media need to help these bumblers out by keeping the story alive. While there remains uncertainty about the degree of meddling and the full extent of contacts Trump’s advisers had with Russians, there is consensus among Kremlinologists that Vladimir Putin preferred Trump to Hillary Clinton. Among the substantive reasons the businessman was apparently attractive to Moscow: His promises to turn America inward, criticisms of the NATO alliance, support for spheres of influence, desire to cut deals and relative lack of concern about human rights. Moreover, there was a general sense that Trump would sow instability in the west, and it has been a truism for centuries that a divided Europe allows for an ascendant Russia. We are being asked now to believe that the Russians wished to influence a U.S. presidential election. This master stroke of statecraft by Putin was designed, however, to bring to power a man, Donald J. Trump, who has pledged to rebuild the United States militarily and economically. Trump has detailed his intent to build a national missile defense, modernize our strategic arsenal to match that of Russia and China, ensure our ability to dominate the high seas with an expanded and more technologically advanced navy, guarantee our ability to project power with an improved air force, and have an intelligence and cyber capability second to none. How any of this is in the Russian strategic interest is yet to be explained. By contrast, Hillary Clinton, following the policies of Barack Obama, stated she would, by not building missile defenses—no small strategic matter—continue the policy of vulnerability to Russian, Chinese, and Iranian ballistic missiles; delay the upkeep and modernization of our nuclear weaponry; and, pursue a reduction of our conventional military forces. On traditional strategic grounds, it defies logic that Putin would have preferred Trump to Clinton. To which must be added that Trump’s energy policy will put downward pressure on oil and gas prices, thus reducing income from Russia’s principal export product.